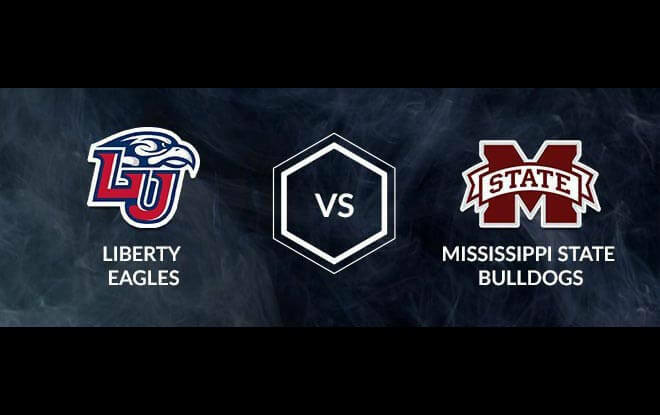 The Mississippi State Bulldogs are 6.5-point favorites to beat the Liberty Flames, according to legal online sports betting odds. The Bulldogs wrapped their season with a 23-10 SU record (10-8 in SEC play). MSU also finished 15-16-1 ATS per the best online sportsbooks. The Bulldogs are coming off a 76-83 loss to Tennessee in the quarterfinals of the SEC tournament as 5.5-point underdogs. The Flames posted a 28-6 record this season (14-2 in Atlantic Sun Conference play). LU was the regular season co-champion as well as the A-Sun champion. Liberty defeated Lipscomb 74-68 in the championship game as 6.5-point dogs. MSU is looking for their first NCAA tourney win since 2008, and LU their first such win ever. According to Mississippi Clarion Ledger, 12 “college basketball personalities” are siding with the Flames, while eight are picking the Bulldogs. Of course, if those “personalities” found themselves at the bottom of the ocean, that’s what you’d call a good start. According to legal online sports betting trends, the Flames have gone 8-2 ATS as underdogs of seven or more points. They have covered four straight games. LU is also 4-0 ATS in their last four when playing a team with a winning SU record. 4-1 ATS in their last five games on Friday. 5-16 ATS in their last 21 games on a neutral court. And 1-6 ATS in their last seven after an ATS win. MSU is lethal from the three-point line, shooting 37.8% to lead the SEC and rank No. 34 in the country. That may help the Bulldogs get the best of the Flames for a second time. Mississippi State beat Liberty 78-67 in the San Juan Shootout in Guaynabo, Puerto Rico in the 2005-06 season. Jamont Gordon scored 20 points and grabbed five rebounds on that occasion. MSU already defeated three of the six teams that defeated LU this season. Namely, Alabama, Vanderbilt, and Austin Peay. The Bulldogs have gone 10-0 straight up and 6-3-1 ATS when favored by 7 or more points this season. As well as 4-1 ATS in their last five non-conference games. 5-2 ATS in their last seven games overall. 35-16-1 ATS in their last 52 games after an ATS loss. And 2-5 ATS in their last seven neutral court games. Pick: MSU players have a bad habit of holding the ball with butterfingers. And Liberty players are like the Hamburglar if burgers were basketballs. This state of affairs narrows the gap between the two schools. That may not be enough to allow the Flames to burn on to second round. However, it could help them remain within the legal online sports betting odds.